Tourstart is an international web site for motorcyclists where it is possible to plan a motorcycle route, share the route with other motorcyclists and get inspiration from other bikers where to go for a motorcycle ride or finding a motorcycle event to participate in. 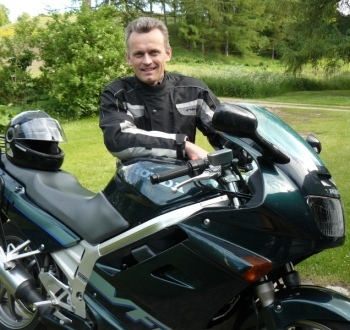 It is pretty simple to answer this question, as I am a dedicated motor cyclist who just wants to assure motorcyclistes in the entire world can share their valuable riding experiences on a web platform. So after starting my motorcycle career in 1986, and still being a dedeicated biker, it was time to try something new. I fancy riding my motorcycle, plan my motorcycle rides , use a GPS device and spend some time on IT. And after some investigations, I found that many other motorcyclists have the same interest, which then was the foundataion of Tourstart. As I find the IT, web and PC stuff pretty fascinating, it made me decide to have a web site made. 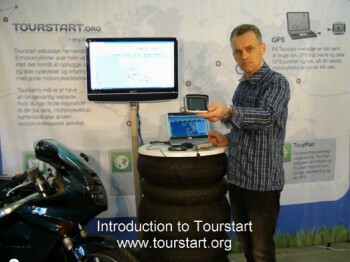 The web site is www.tourstart.org and on Tourstart we focus on riding the bike and all the fun you can get out of it – and a strong focus is on sharing your knowledge with other motor bikers. A bit about me and my motorcycle background. I have a Honda VFR 750 which I bought as new years back. It replaced a Honda 400/4, which is still in the garage. The VFR does the job pretty good, and to add more fun into my life I grabbed into my pocket one day and luckily found enough money so I could go and get a Garmin and TomTom GPS. Never really been a fan of a GPS until I got one and found all the good stuff it will do to you. Always believed the old style printed map did fine. The map is still fine, but it needs to be as a supplement to the GPS. I realized it is never too late to learn some new tricks. And when the GPS is connected to the PC it gets really fun. Now I use the GPS when ever I go motorcycle touring, just ride the bike or when I am planning a route I want to ride. I never ride my bike without the GPS mounted, as I find it amusing to see how accurate the speed is displayed and the roads in the area I am riding. Even when I ride on known routes, it is nice to see the accurate arrival time. With the GPS I can now relax and enjoy the motorcycle ride, resting assure that the GPS will guide me on all the great motorcycle roads. Tourstart is made with the aim it shall be easy to create a motorcycle route and transfer to motorcycle GPS, such as Garmin, TomTom and Navigon GPS devices, as well as getting gpx files. When made a motorcycle route and you want to share it with other motorcyclists, anybody can download the route to exactly their own GPS. With this free and open platform, any motorcyclists can share routes, no matter which GPS type we may have. Click on the picture to see a YouTube introduciton video of Tourstart.